Does anyone know how to escalate a UK visa refusal issue beyond the complaints department in UKVI? Who would be the person in charge and his/her email address? 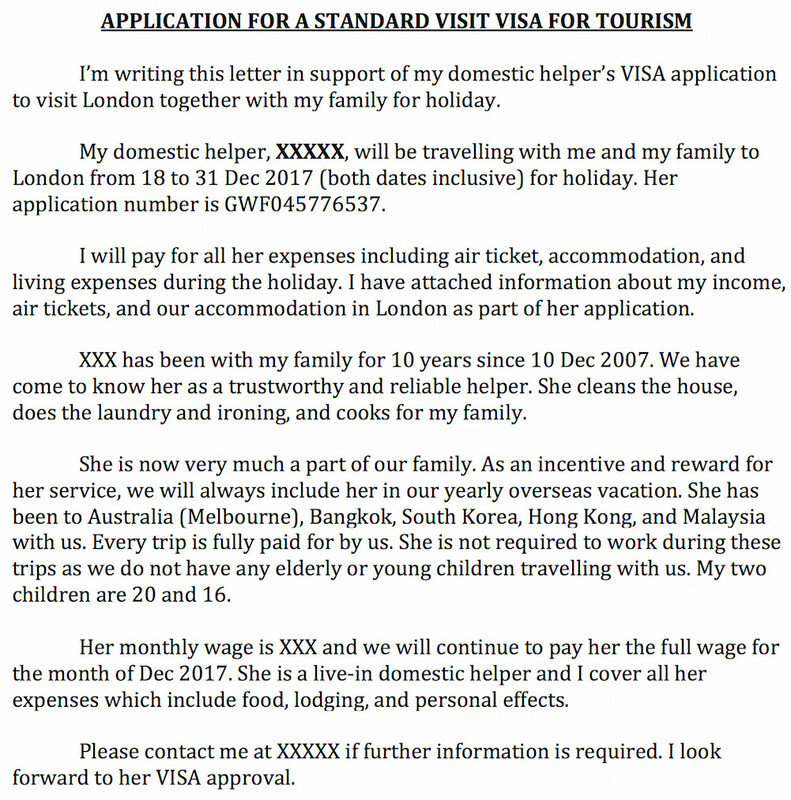 My domestic helper was refused a Tourist Visa to go on a family holiday with us to London last December. She has been with my family for well over 10 years. I stated categorically in my letter of support as well as in her visa application that she was not expected to work in the two weeks we were in London. I also stated that I will pay for all her expenses there. I provided all the necessary documentation (my salary slips, paid Airbnb accommodations and 2-way air tickers for me, my wife, my daughter, and hers). I've also indicated that she has been travelling with us for such family holidays to Australia, South Korea, Taiwan, Bangkok, Hong Kong, and Malaysia. She didn't have any problem getting a visa for Australia, South Korea and Taiwan. There's all that is said in the decision. I have already had about 3 rounds of exchange with the complaints department and visa department. A bit of ding-dong here and there. The gist of my complaint was that the ECO did not carry out their evaluation in a professional manner. First, nowhere in the application did I indicate that my domestic helper was there to work. We were going to be in London for only 2 weeks. What kind of work do you expect?? My domestic helper is close to my family especially my daughter whom she helped to look after for many years. I asked the complaints department to show me where in my application did I say she was there to work. So far, in their replies, they have not done so. Not surprising, because there is simply no evidence. Second, the ECO dismissed the application with just one liner: I don't believe your employer would pay for your expenses. Period. No further elaboration despite the fact that I've already bought her air ticket and accommodation. I asked my domestic helper if the ECO attempted to contact her to verify her application. There was no attempt at all. I also highlighted this in my complaint to the department. In the few email replies from them, there was nothing new to add. No further evidence from the visa application was highlighted to substantiate their assessment. This is rather unprofessional. It looks like I'm going in circle with them. Hence, I would like to know who else I could escalate the matter to in the UKVI department. Those who live in the UK would probably know who the department head is and how to contact him/her. I think it's time to escalate the matter. I live in Singapore and my domestic helper is Indonesian. Some of you asked about the ODW application. I did apply for a ODW, precisely because I wanted to please the ECO and do the "right thing". I searched the internet for information and I realised that in most of the cases I read about, the employer was bringing the ODW in for at least a few months. I was only there for 2 weeks of holiday. 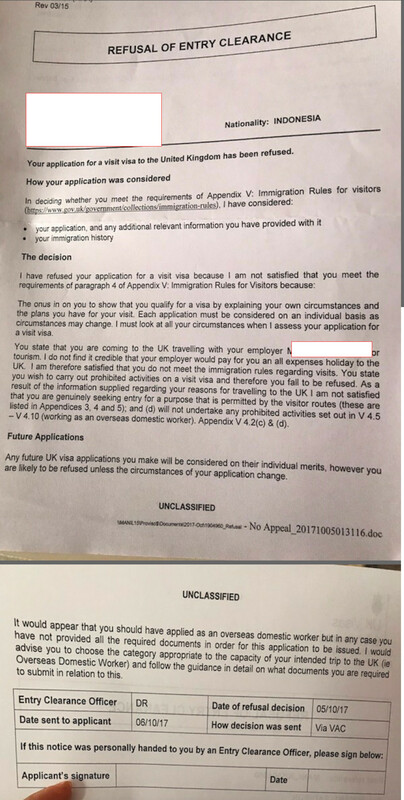 "I again apologise if I have raised your hopes, however, the fact that the applicant has applied as an Overseas Domestic Worker less than one month after applying to enter the UK as a visitor does raise concerns and whilst I am aware of your comments as an employer regarding her working hours and minimum wage, I am mindful that since the 06th April 2015, the Immigration Rules for Overseas Domestic Worker (Visitors) under Paragraph 159A were amended requiring the employer to provide details of the applicant’s employment in the UK (Appendix 7) and a statement confirming that the applicant is an employee and that the work that she will carry out will not constitute work within the meaning of paragraph 2(2) of the National Minimum Wage Regulations 1999. The forms submitted in support of the ODW application showed errors over the minimum wage and the employer’s statement was not submitted with the application"
So, first my domestic helper was rejected the tourist visa and asked to apply for a ODW visa even though I said repeatedly that she doesn't need to work. I don't have elderly or children under 5 travelling with me. Never mind, we just want a peaceful holiday, like the many others we have taken together in the last 10 years. And now, the ECM uses this second application against me. Unbelievable. I'm not just aggrieved, I'm quite pissed off actually. Thanks for all who have given me their views and assistance. I've received a final resolution to the issue from UKVI. Although it took a long while to pursue the matter, I'm glad it's finally cleared up and with the last email from UKVI, I should be able to apply for a tourist visa for my helper the next time we plan for a London trip. Here's the final reply. The fourth paragraph refers to the Tourist visa decision which they finally agreed should be overturned. The fifth paragraph is the ODW visa application which they have agreed to refund me the application fee since the Tourist visa application was upheld as the correct decision. Thank you for your email correspondence of 22 December 2017 where you have raised a complaint about the handling of your Entry Clearance applications. I apologise for the delay in replying. You have said that you are not satisfied with the consideration of your Entry Clearance applications submitted on 29 September and 25 October 2017. I am partially upholding your complaint. I have forwarded the issues you have raised to a Entry Clearance Manager in the relevant department who has advised that the decision of Entry Clearance, reference number, GWF045776537 has been overturned and will be reconsidered when you submit your passport but there will be no refund on this case. This part of your complaint is not up-held. Entry Clearance reference number, GWF046018818, the decision is subject to an administrative review but given we are going to reconsider the above case, I will authorise a refund on this application. Refunds can take up to 28 days to reach the account that the fees were paid from. This part of your complaint is up-held. As previously advised I can confirm that your complaint has been investigated through our appropriate internal channels but we are unable to provide you with the results of our investigation. I hope this answers your concerns and this information is helpful. I am sorry our service has not met your expectations and that you have found it necessary to make a complaint. We believe we have addressed all the points you have raised. However if you feel that there are specific aspects that have not been addressed you can request a review of our response within one month of the date on this letter by writing to us at: complaintsreview@homeoffice.gsi.gov.uk. Please ensure that you provide us with specific details setting out why you believe a review is required. This will enable us to provide you with a full response. There is generally no appeals process for a Standard Visitor Visa. This isn't a situation where there's a department head you can write and get a different result. The options are to apply again, appeal on human rights grounds, or go to court. For the latter two, you'd want a qualified UK immigration lawyer to represent you, and you'd have to identify some grounds beyond not liking the decision for what would be expensive and lengthy proceedings. I realize you are aggrieved by this, and I sympathize. I will trust that you are a lovely person who wants to give this gift of a vacation to someone you have become close to and that you do not expect her to work in any way. However, it is the ECO's job to assess the credibility of applications. ECO's don't always get it right, but they're not expected to be perfect, but rather to make judgements. They asked themselves "which is more likely: an employer flying their domestic helper half-way across the world because they're very nice, or because they expect them to work?" Unfortunately, The ECO believed the latter, and it's hard to imagine what kind of evidence of your intentions you can supply to overcome that belief. As the ECO advises, the Overseas Domestic Worker visa, while expensive, will get around this problem, because you won't have to convince anybody that no work will be performed. You haven't told us why that application was rejected, but I would carefully read the refusal notice, the instructions, and perhaps the internal guidance the ECO used to review your application. You could post that refusal notice as a new question here, if you'd like people to take a look at it. You also have the option to hire a UK immigration lawyer to look at your case and assist in preparing a new application. In the case of multiple refusals, that can be the best path forward if you want to continue to pursue this, so as to avoid looking desperate with an escalating series of failed applications. This does not help with the immediate problem, but you may be able to fix it in the long term. The core problem is that you, your family, and the domestic worker are all used to her doing certain jobs. Staying together at an Airbnb creates a risk that you will drop into that habitual pattern. You need positive evidence that her travel is a bonus, not a case of continuing to work for you during the trip. For your next few vacations, send your domestic helper on a separate tour or cruise, or to visit family. If she picks her own destination, you will accumulate evidence that her travel during your vacations is a bonus, not a case of her continuing to work during the vacation. For this purpose, prior trips she has taken with you are not good evidence - there is no way for the immigration official to know whether she was working at all. If you try to bring her with you to the UK again, also make sure you have proof of how the domestic work is going to get done without her doing any of it. You could stay at a hotel in rooms without a kitchen, so the hotel staff will do the cleaning and you will obviously be eating out or ordering prepared food. If you stay at an Airbnb or similar, hire someone local to do the cleaning, laundry etc. that your domestic worker does at home, and include their contract in the application.